I have been a creative soul-passionate about color and style since I was a little girl. I know I was heading in the right direction when my favorite hobbies included organizing my doll’s outfits as well as my own and coloring on my parents’ walls with crayons and markers (they were not happy about that one)! I was born and raised a Polish-American Jersey girl that always loved pursuing creative and artistic endeavors. That artistic flair led me to graduate with a Bachelor Degree in Advertising Art & Design from Seton Hall University. My passion for fashion led me to the fashion industry in New York City. Over the years, I developed an extensive background with over 15 years experience in many facets of the fashion industry and business including Merchandising Management and Director of Fashion Merchandising. Being a jet-setting, artsy fashionista, my imagination was always sparked while traveling. That inspiration fueled my visionary spirit. By bringing my love of creativity to the New York Art scene as formerly Barbara Andranowski, became an award-winning Artist and displayed my artwork in New York City, New Jersey as well as fundraiser shows in Los Angeles, California under Baya Designs. Since I felt my art pieces had such an aesthetic quality and made great decor pieces, I created a home decor line of artwork called Styling with Intention Art Decor. As passionate as I was about Fashion, my other great loves were Wellness, Home Design and Decor as well as the Mind/Body/Spirit connection. I took additional numerous certification courses in this field including Feng Shui Design. Being naturally perceptive, insightful & certified in IET (Integrated Energy Therapy & Color Therapy) , I found there’s such a connection between what is going on with us, our life and our space -I decided to explore this further.
. I discovered true transformation first happens within by creating inner shifts that create positive outer changes in your life. By shifting your mindset for success, you obtain a confident, empowered new sense of self. I therefore, created my programs to be holistically based as well as based on the principles of Feng Shui. Styling is my passion and decided to become a Fashion & Interior Stylist and Lifestyle Designer. I am also a mom entrepreneur, certified Feng Shui consultant, speaker, published author and freelance writer. I’m happy to share that I am the creator and host of Style Soul Podcast. This is my WHY. I created Styling With Intention because I felt inspired to do the work I love and help others. By styling our life with intention, our family made our dream come true. Since we’re lovers of the beach and warm climate, we moved to Sarasota, Florida and LOVING it! Being a mom entrepreneur, allowed me to spend more quality time with my family- our two boys and my wonderful husband Terry Culkin. I became passionate about helping people create an emotionally and aesthetically pleasing space they can enjoy, create an amazing signature style that reflects them and help them create a life of enthusiasm and success. Life’s too short to be stuck in a place that doesn’t fulfill you. There’s no time like the present to make the changes you want in your life. Life is precious. I know this very well. 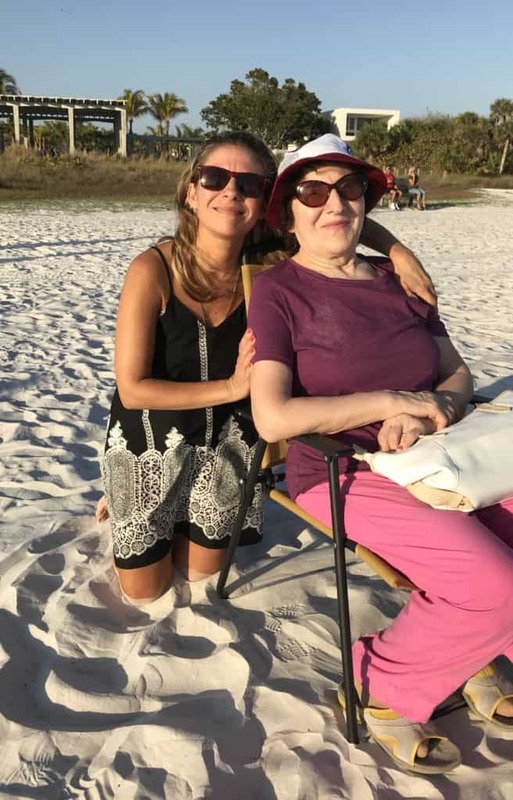 My mom passed away suddenly and it shook my world to the core. She was a best friend, my cheerleader, a loving and caring soul- a true earth angel. To experience a loss like that is truly devastating. Being an Artist, Stylist & Designer, my work is all about inspiring others and creating beauty in their space and life. Truth is- I didn’t feel too inspired or creative at that time. It was very tough. On my Birthday, I wanted to visit the beach. The beach is my ultimate happy place. Living near the beach here in sunny Sarasota, Florida is a true inspiration everyday. Life here feels amazing. Being at the beach brought back memories of her and happy times we shared there together. The first time she visited Siesta Key Beach she said it was one of the most beautiful places she’s ever seen. And it truly is a magical place. We had wonderful family memories there together that I will always treasure in my heart. I always remember those touching words. Seeing all the beauty of the beach, nature and bright tropical flowers-which she LOVED- brought my inspiration back to life.I was inspired to ‘Bring the Beach Home’ by Styling With Intention by my mom. I miss her more than words can express everyday. But, I found comfort in my ‘happy place’ and it soothed my soul and inspired me to create again. The creativity once again blossomed within me. I ‘brought home’ those happy place moments and memories we shared. For many of us, the beach is our happy place. The place we relax and just feel good. We create memorable ‘happy place’ moments here with the ones we love. I know it is for me. It’s the place I feel inspired, connected to nature and believe ANYTHING is possible! Whether you need encouragement, inspiration, comfort or just some feel good beachy vibes- I hope this cozy coastal corner brings inspiration to your space, heart and soul.